St. George’s Day – The Neglected Saint. St. George’s Day is on the 23rd April and It is England’s national day. As a protestants from Northern Ireland who has made England his home – I feel appalled and outraged ( just a little) by the fact that St. George’s Day is all but ignored by the rest of the UK and has never been honoured with a Bank Holiday – such as Scotland’s Wee Willie Burns Day and Ireland’s St. Patrick Day Piss-up (he was in fact Roman/English) . Through the years there have been many calls for St. George’s Day to be made a bank holidays and I’m right behind this cause – Stop neglecting poor St George and give us a Bank Holiday to celebrate England’s long and glorious history. Do you think St. George’s Day should be a Bank Holiday ? St. George is the patron saint of England and his emblem is a red cross on a white background, which is also the flag of England, and part of the British flag. The most famous legend of Saint George is of him slaying a dragon. In the Middle Ages the dragon was commonly used to represent the Devil. The slaying of the dragon by St George was first credited to him in the twelfth century, long after his death. 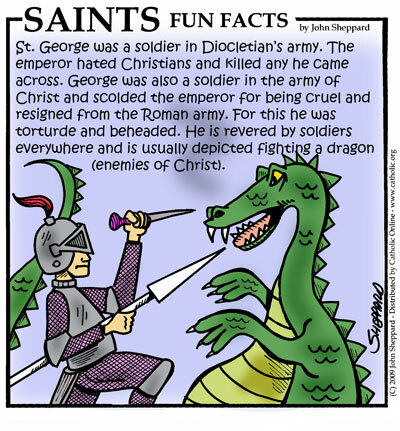 It is therefore likely that the many stories connected with St George’s name are fictitious. Saint George is the patron saint of England and as such is celebrated annually on 23 April, the day of his death in 303 AD. See Saint George’s Day for more information. Saint George never visited the British Isles in his lifetime, but during the Middle Ages he became revered by the English and according to legend fought on their side in the Crusades and the Hundred Years’ War. After the union of England and Scotland in 1707, celebration of the day waned in popularity, but in modern times it remains as a celebration of English culture. The earliest documented mention of St George in England comes from the venerable Bede (c. 673–735). His feast day is also mentioned in the Durham Collectar, a ninth-century liturgical work. The will of Alfred the Great is said to refer to the saint, in a reference to the church of Fordington, Dorset.Certainly at Fordington a stone over the south door records the miraculous appearance of St George to lead crusaders into battle.Early (c. 10th century) dedications of churches to St George are noted in England, for example at Fordington, Dorset, at Thetford, Southwark and Doncaster. Edward III (1327–1377) put his Order of the Garter (founded c. 1348) under the patronage of St. George. This order is still the foremost order of knighthood in England and St George’s Chapel at Windsor Castle was built by Edward IV and Henry VII in honour of the order. The badge of the Order shows Saint George on horseback slaying the dragon. Froissart observed the English invoking St. George as a battle cry on several occasions during the Hundred Years’ War (1337–1453). Certain English soldiers displayed the pennon of St George. In his play Henry V, William Shakespeare has the title character utter a now-famous invocation of the Saint at Harfleur prior to the battle of Agincourt (1415): “Follow your spirit, and upon this charge Cry ‘God for Harry, England, and Saint George! '” At Agincourt many believed they saw him fighting on the English side. St. George’s feast day in England was no different from the numerous saints on the liturgical calendar until the Late Middle Ages. In the past, historians mistakenly pointed to the Synod of Oxford in 1222 as elevating the feast to special prominence, but the earliest manuscripts of the synod’s declaration do not mention the feast of St George. The declarations of the Province of Canterbury in 1415 and the Province of York in 1421 elevated the feast to a double major, and as a result, work was prohibited and church attendance was mandatory. During the Tudor period the celebration of feast of Saint George’s was abolished along with most of the other saints, with them went the tradition of flying saint’s flags in public (to be replaced with royal badges on banners). The one exception was the Cross of Saint George. The tradition of celebration St George’s day had waned by the end of the 18th century after the union of England and Scotland. The Royal Society of St. George, dedicated to promoting English culture including St George’s Day, was founded in 1894 and famous members have included Sir Winston Churchill. In recent years the popularity of St George’s Day appears to have been gradually increasing. In March 2002 the London Mayor sparked controversy by announcing plans to spend £100,000 to mark St Patrick’s Day – after refusing to organise a celebration for St George’s Day. He also stated that he would dye the Trafalgar Square fountains green On St George’s Day that year members of the Campaign for an English Parliament (www.thecep.org.uk) protested at the mayor’s lack of support for St George’s Day by dying the fountains in Trafalgar Square red. Around July of that year the Campaign’s London co-ordinator put the idea to the London Branch that they should set up a company to establish a St George’s Day event in London. Several were in agreement and they pooled their money together. The ethos of the company was to promote St George’s Day in the face of some lukewarm response both from the London media and of course the mayor’s constant disparaging words about St George. He was reported to have said that there was no call for the day to be celebrated and indeed poo-pooed the idea. They applied to Westminster Council to hold an event. It was very forthcoming with documents that stood at least 6″ thick. However one member contacted Covent Garden directly, and instantly began a rapport with the management, suddenly the 6″ of paperwork became a ½”. Whilst he was dealing with Covent Garden the others had set the wheels in motion to become a limited company and this was finally completed, ironically, on St.Patrick’s Day 2003. The relationship with Covent Garden continued and the first event held under the St George’s Day Events company was on April 23rd 2003, although only a small affair it was the beginning of what was to become the London celebrations. In 2004, they were in touch with the English Folk Dance and Song Society, who gladly appeared at Covent Garden. 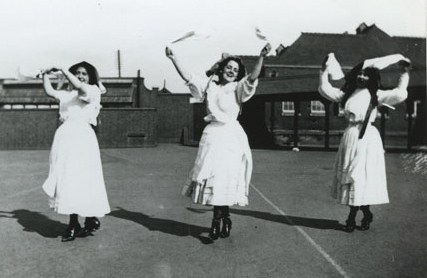 Although funds were severely limited they continually looked for new acts. In November, they turned to the London Assembly for funding, were given the criteria by the Assembly and with the help of Cross of St George Association a grant of £2500 was to be made to the St George’s Day Events company but as with anything of this nature hurdles were put in their way. The biggest one was that they had to have an advertisement in the London events guide ‘Time Out’, but with 24hrs to go before the printing deadline in the early hours of the morning they were informed of the format the advertisement should be in. Nevertheless the spirit of St George must have been with them because no sooner had a scathing letter to the London Assembly leisure committee been composed, than their graphics artist had manipulated the advertisement to the Assembly liking and thus it went ahead. The St George’s Day events in Covent Garden 2004 were set up and once again the spirit of St George was with them, they could not have been blessed with better weather, a lovely sunny day with a small breeze to keep the flags flying to attention, the acts included :- Punch and Judy, English Folk Dancers, Mummers Players, Morris Dancers and some good old English folk music, for a group of amateurs the event went without a hitch and was enjoyed by all, a big thanks for Cross of St George Association for help with this event they were magnificent. Fortunately, they were contacted by the Royal Society of St.George as to what they could do to make the event much bigger and indeed better, with the Company’s help and with their clout St George’s Day 2006 was even a bigger success than before. BBC Radio 3 had a full programme of St George’s Day events in 2006, and Andrew Rosindell, Conservative MP for Romford, has been putting the argument forward in the House of Commons to make St George’s Day a public holiday. In early 2009 Mayor of London Boris Johnson spearheaded a campaign to encourage the celebration of St George’s Day. Today St George’s day may be celebrated with anything English from morris dancing to a Punch and Judy show. In 2011, a campaign to make St. George’s Day a public holiday in England began on the UK government’s e-petition website. It received 4,266 signatures, not achieving the 100,000 signatures required before the deadline in August 2012 to make a debate of the matter in the House of Commons a possibility. A traditional custom on St George’s day is to wear a red rose in one’s lapel, though this is no longer widely practised. Another custom is to fly or adorn the St George’s Cross flag, the flag of England, in some way: pubs in particular can be seen on 23 April festooned with garlands of St George’s crosses. It is customary for the hymn “Jerusalem” to be sung in cathedrals, churches and chapels on St George’s Day, or on the Sunday closest to it. Traditional English foods and drink (e.g. afternoon tea) may be consumed. There is a growing reaction to the recent indifference to St George’s Day. Organisations such as English Heritage, and the Royal Society of Saint George have been encouraging celebrations. There have also been calls from some commentators to replace St George as patron saint of England, on claims that he was an obscure figure who had no direct connection with the country. However, there is no obvious consensus as to whom to replace him with, though names suggested include Edmund the Martyr, Cuthbert of Lindisfarne, or Saint Alban, with the latter having topped a BBC Radio 4 poll on the subject. British scouting organisations such as The Scout Association celebrate St George’s Day. St George was selected by scouting founder Robert Baden-Powell as the patron saint of the movement. Most scout districts host events on the Sunday closest to St George’s day, often a parade and religious service for their members. Additional celebrations involve the commemoration of the 23 April as Shakespeare‘s birthday and death. Shakespeare is known to have been baptised on 26 April 1564 and to have died on 23 April 1616. 23 April is widely recognised as his traditional date of birth and commemorated on this day every year in his home Stratford upon Avon and throughout the world.